I can’t believe it’s almost Christmas! It snowed last week in West Texas! Yes – SNOWED! Here I was hoping for some warm weather and we got a ridiculous cold front. I pulled out my London fog wool coat to help combat the cold. I was very happy that I got this red London Fog wool coat as a birthday gift last November. This coat was part of my ‘Whit’s Wishlist’ back in September. 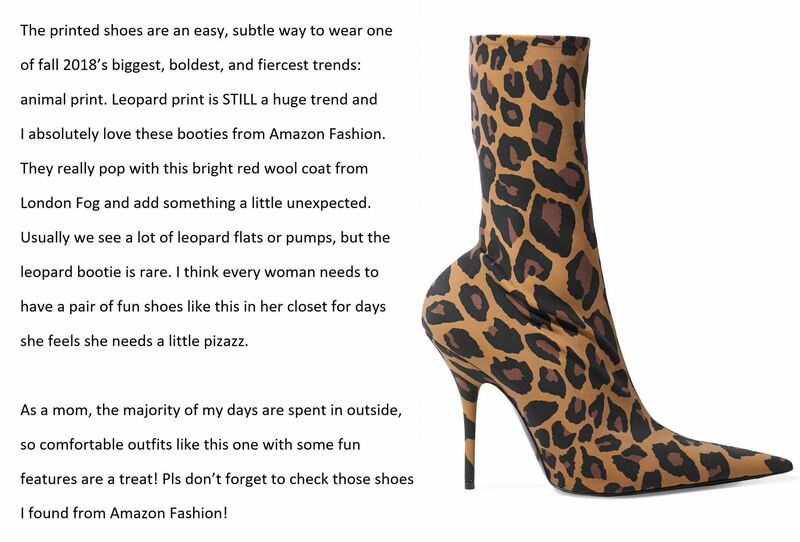 I paired these amazing leopard ankle sock booties that I found at Amazon Fashion. I added a cozy plaid chunky scarf from Amazon Fashion to fight these 30-degree temperatures. This scarf is still available at Amazon website. Check out my shop the look link above. You will never go wrong with a red coat. If you want to create an elegant look, then you better try on LBD on with your leopard ankle boots. But keep in mind one thing, this print has to be the only one that you will use in your evening outfit. In blog news – I have been hard at work on creating new content, working on a blog redesign. I also put a new subscribe pop up . Don’t forget to subscribe to our newsletter. Thank you so much for stopping by today. Have a wonderful Christmas! Those boots are amazing, totally love them. I’m obsessed over your leopard boots! Wow, I just recently saw a pair of leopard boots earlier in the mall but it was expensive for me to buy it. I love the outfit!!! Looking so fab and sassy dear! You’re absolutely rocking those boots. Can’t believe it snowed in Texas either !!! Love these leopard print boots and you styled them so perfectly. Wishing you and your family a Merry Christmas and Happy Holiday. I’m usually not a leopard print person, but I’ve definitely been eyeing some cute leopard print booties. I love these leopard-patterned boots. I am looking forward to new blog posts.